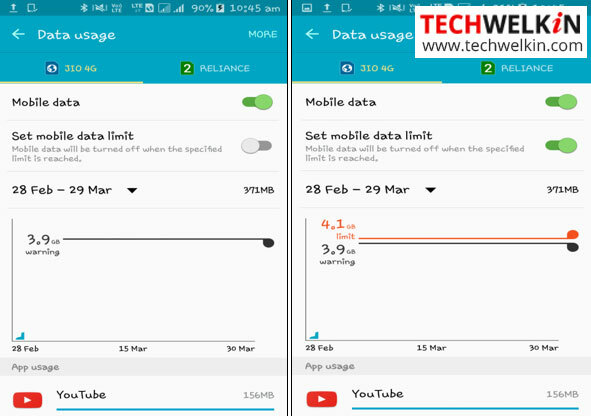 Very useful tips for reducing mobile data usage. Many people simply turn mobile data off to save data pack. But with these tips, you will be able to save wastage of data and thus you can keep your mobile data connection on all the time. There are countries where mobile internet is an expensive commodity. Users get data packs for considerably high price and one has to use it wisely in order to save data and in turn, money. It is high time when extravagant mobile internet users should learn a few tips to use mobile data wisely. Being thrifty is the only option to restrain limited mobile data plans from burning hole in your pocket. There are many mobile handsets in the market that comes with inbuilt feature of ‘data saving mode’ and ‘ultra data saving mode’. But, they may not be in alignment to your personal preferences and need of using data on certain specific applications. They may block your favorite apps from sending you notifications or working as desired. So regardless of your handset and its features you should take a look at these tips to reduce your mobile data usage. This article is meant for providing useful tips for reducing your mobile data usage and save every precious kilobytes for which you are paying your hard earned money. Even if you are not using any apps or even your mobile phone, your data is being consumed continuously by the apps in your mobile. The good thing here is that you have the authority to restrict applications from using background data. You cannot treat every application equally… you need some of them regularly while the others are used occasionally. You may specifically choose to restrict background data for some of the apps and give some others the liberty of using background data to keep you notified and updated. For this you need to go to the mobile Settings -> Apps data usage. Here you will find the list of applications in your mobile. 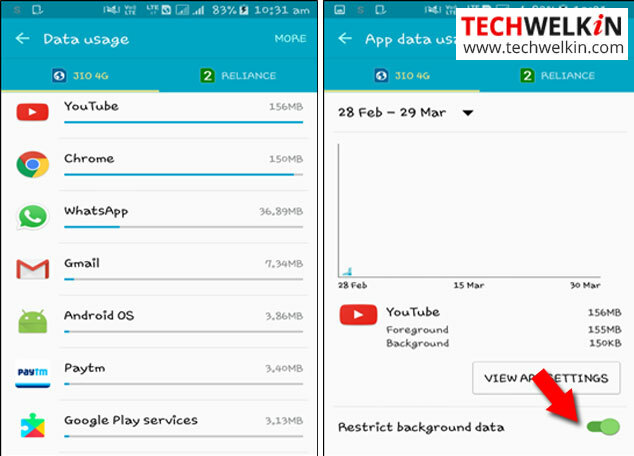 Tap on the specific application and you will find the information about ‘foreground’ and ‘background’ data usage by that particular application and the option to ‘Restrict background data’. This one is the basic things that every person with limited data plan should do. Setting a data limit can save your main account balance in case you have used the whole data provided to you according to your data plan. For setting this data limit you have to go to your Settings -> Data Usage -> turn on the ‘set mobile data limit’. And, then you can adjust the ‘warning’ and ‘limit’ lines on the graph provided. 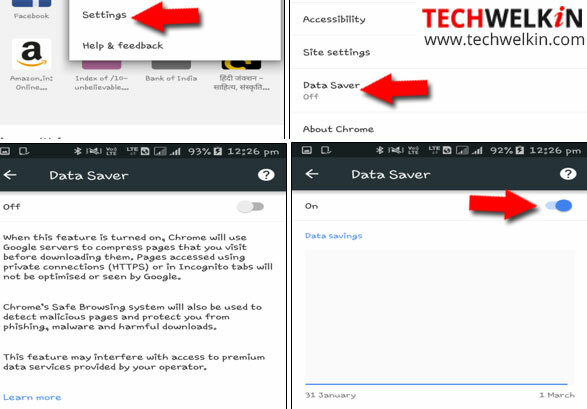 You may use light browsers like Opera Mini or UC Browser to limit the usage of data while browsing webpages. Many people are reluctant in using these browsers and prefer more popular browsers. If you are one of them then consider using Chrome with its data compressing feature. For this you need to open the Chrome browser and touch the three dots menu symbol on the upper right hand side. Tap on Settings from the drop down menu. Scroll down and tap on ‘Data Saver’ and then turn it ‘On’. Set your mobile to update the installed apps only when you are connected to Wi-Fi. This will save you lots of data. For this setting you need to open your Google Play Store and tap the menu button with three parallel lines at the top left. Scroll down to find the Settings. The first thing you will find in settings list is Auto-update apps option. Tap and set it to Auto-update apps over Wi-Fi only. Using Hotspot? Please change the above setting if you are going to connect through the mobile Wi-Fi of someone else because they too may have a limited data plan! If someone is helping, you should also make effort of not taking too much! And, if it’s you who is going to help someone by turning on your hotspot — then ask that person to change such Wi-Fi settings in their mobile phone. The Maps applications are now giving you the privilege to cache your maps or save a route for offline use. If you are in big and crowded cities like Mumbai, Bangalore, Delhi where traffic is a regular issue then you have to rely on real time maps as Google maps can show you real time traffic. But if you are in small cities where traffic is not a big issue then you can easily cache map data and use offline map to get to your destination. Whatsapp the most popular instant messaging application comes with options that can reduce your mobile data usage. When you go to WhatsApp settings, you will find an option ‘Data Usage’. Here you will see 2 sections – Media auto-download and Call settings. In the Media auto-download section you can set your preferences for downloading media on mobile network, on Wi-Fi and when roaming. Choosing No Media to auto-download using mobile data is the best option as many times we get same picture, animation and video from different friends. Downloading them will not only cost you data but this stuff will also occupy mobile storage unnecessarily. Now come to the Call Settings. Here you have only one option… tap the check box against ‘Low data usage’ to lower the amount of data consumed while making WhatsApp calls. YouTube also gives options to save our mobile data. Open YouTube app and go to Settings. Then go to General and find various options to save data. ‘Limit mobile data usage’ option is for streaming HD quality video only when connected to Wi-Fi. You can switch off the ‘Auto play’ so that YouTube cannot tempt you with videos that you were not going to see otherwise. You should also be aware of YouTube’s offline video feature… save offline videos when connected to Wi-Fi to save your mobile data. Hope this article helped you in figuring out how you can reduce data usage and save data on your mobile phone. These tips will help you in sustaining with limited data packs after enjoying the lavishness of (almost) unlimited free data for so long. If you have any query or you want to suggest some more tips on reducing mobile data usage feel free to drop your comments. Thank you for using TechWelkin! Interesting research and nice tips. thanks for sharing!